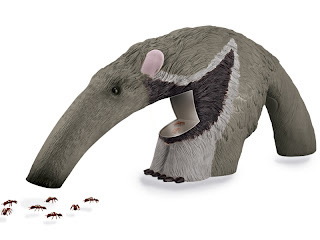 Flip Out Mama: Nat Geo WILD Anteater Bug Vac from Uncle Milton! Okay, if I had to choose only one brand of toys to buy each of my kids for the rest of forever, the choice for Tater would without a doubt be Uncle Milton. They make the coolest toys, specializing in "scientific" type toys. They are right up Tater's alley. We got a chance to review one of their new Nat Geo WILD toys recently, and.. oh my goodness, was it ever a hit! The whole Nat Geo Wild line is absolutely awesome, they have everything! They even have a video camera that goes on your dog's collar to record pet's eye view videos. Now I think that is awesome. We really liked the Anteater. We saw it featured on the today show and were pretty excited to try it out ourselves. We live on two acres out in the country, so we have a plethora of bugs to go around! Tater's only qualms about the bug vac were that the suction isn't that strong, so sometimes the bugs would just fall back out. But, that isn't a big deal to him. He did like that the vacumn wasn't strong enough to kill the bugs so that was a good thing. He liked being able to observe them when they were still alive. All in all, this was a great toy and I am really happy that we got to try it out! It is absolutely perfect for my little scientist! IF you would like to check out other Uncle Milton products, go to their site today! We received a sample product in order to conduct this review, however all opinions and thoughts are my own.